Find out about the equipment which has been developed in a joint venture by two companies, innovators in the natural stone manufacturing industry. The combination of SOLANCIS' knowledge resulting from its field experience, together with the technical know-how of the company CEI by Zipor, has resulted in a partnership which allows for the development of more precise and improved equipment for the selection and optimization of the raw material, as well as an increase in production. In 2005, the first prototype Stone Jet began testing at SOLANCIS. The innovation lies in the union of two cutting systems within one machine — a disc and a water jet which make rounded cuts. 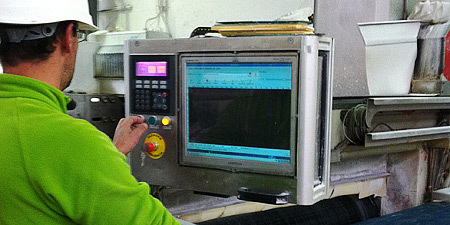 Furthermore, the Stone Jet digitalizes the slab in order to detect any defects. Following years of successful testing, the prototype was finally introduced to the marketplace. With the objective of increased production, the cooperation between the two companies gave rise to the Stone Cut. Maintaining the same selection procedure found in the Stone Jet, the new equipment is simplified. The main difference is it uses only a single disc and makes only straight cuts. The partnership progressed with the development of a five axis Numerical Control Computer (CNC) which models the pieces in various ways. Cornices, sills or 3D Facades are all produced with this equipment. More recently, the Stone Cut Mille entered into the manufacturing phase. This machine has a variety of functions. It digitalizes and classifies the slab, does finishing (only on the perfect areas of the stone), as well as cutting and modelling the piece. It is meant for use only with the thickest of slabs: steps, planters, kerbs, cubes, Portuguese paving, etc. The introduction of this innovative machinery into the market place was well received by industry. It goes to show that the cooperation and united efforts of SOLANCIS and CEI by Zipor is advantageous not only to the partnership, but also to the natural stone manufacturing industry.